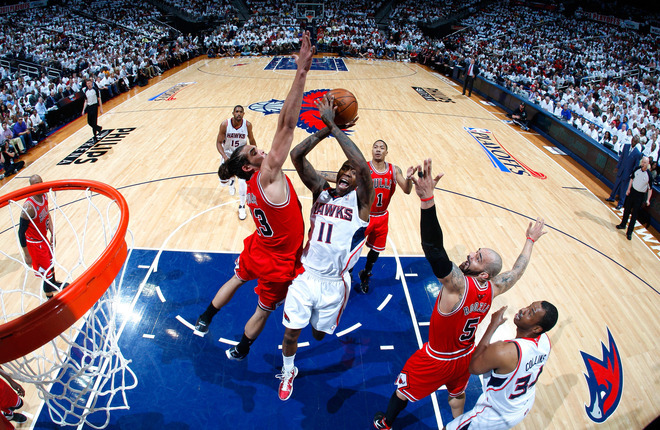 The Bulls dominant 93-73 Game 6 win clinched the second round of the seven-game series against the Hawks. Between them and the NBA Finals are on the Heat. The Bulls just plain ol' shut down the Hawks with their defense and got a ton of buckets to make closing out their second round opponent look easy in Atlanta. The win clinched the best-of-seven series to move on to the Eastern Conference Finals where they will face the Heat, marking the first time the franchise has progress so far in the NBA Playoffs since 1998. The Bulls went on a 7-0 run early to put them up 11-4 at the 3:25 mark of the game and never turned back, as the Hawks never led or even won a quarter in the Thursday night rout. The Bulls didn't get to the FT line (8-for-10, 80%), grab offensive rebounds (only six), nor did they hit a lot of 3-pointers (3-for-13, 23.1%). They just simply got buckets at a ridiculous percentage (53.1%), moving the ball extremely well and took care of the basketball (10 turnovers) against a Hawks team with nothing left in the tank to move off the ball in order to counter the Bulls' excellent help defense. On the other end, the Bulls held Atlanta to an embarrassing 36.5% shooting and only 1-for-11 on 3s (9.1%). Carlos Boozer (23 points on 10-for-16, 10 rebounds, five assists, 35 minutes) was the unstoppable easy button for the Bulls offense that we saw throughout the mid-season. He was 3-for-4 at the rim, but took advantage of the space given to him by Al Horford and Jason Collins to hit 7-of-12 jumpshots -- 5-for-8 on long-2s. Derrick Rose was engineered the offense as amazing as you'd want. 34 of the Bulls' 41 buckets were assisted -- 12 by Rose, who finished with 19 points on 8-for-14 shooting and four rebounds in 38 minutes. Luol Deng (13 points on 6-for-14, five rebounds, five steals, five assists, 40 minutes), Joakim Noah (11 points on 5-for-7, six rebounds, five blocks, 27 minutes), and Taj Gibson (10 points on 5-for-7, four rebounds, 14 minutes) were the other three Bulls in double figures. The Bulls seven steals, 47 forced bricks, and 74.3 defensive rebounding rate proved to be their best offense, as they relentlessly ran the floor to create disruption in the Hawks' resets and find easy buckets. Being an extraordinarily unstoppable 13-for-26 (50%) on long-2s didn't hurt either. The 'Heatles' closed out the Celtics in Game 5 of the other Eastern Conference Semis series to advance to the seven-game Eastern Conference Finals that will begin Sunday evening at the United Center.